Alison Shaffer: Enter to win tickets to see SURGE in a two night only event in theaters this October. Enter to win tickets to see SURGE in a two night only event in theaters this October. A special two night event is coming to a theater near you. Find Power, Glory, and Music in SURGE. Coming to theaters for two nights only, October 9 and 16, 2013. To find a theater, and for tickets go to www.SurgeExperience.com. See and hear the Christian Message in this powerful night at SURGE's interactive show reaching a generation of teens and young adults. SURGE Offers musical performances by: Casting Crowns, Newsboys, Lecrae and worship artists Acquire the Fire LIVE. Acquire The Fire & Teen Mania present an exciting and limited theatrical engagement debut of SURGE, a high-energy interactive movie theater event that fuses music, comedy, and inspirational messages creating a moment where young people and those who believe in them fill theaters across North America. SURGE features empowering and inspirational messages by Ron Luce interwoven between the hilarious comedy of John Gray and musical performances by award-winning Christian artists Casting Crowns, Newsboys, Lecrae and worship artists Acquire the Fire LIVE. SURGE offers an evening that will inspire, entertain and empower generations looking to make a difference. 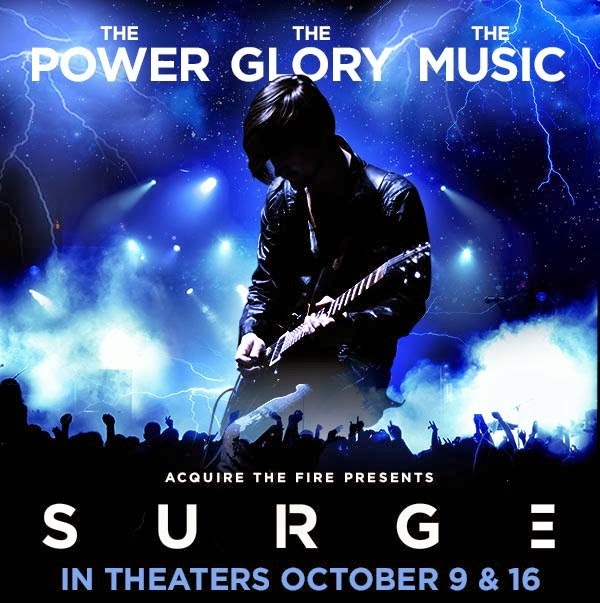 Screenvision, a national leader in cinema advertising sales, services and content distribution, is partnering with Acquire The Fire and Teen Mania as the U.S. distributor of SURGE, which will premiere on over 400 screens on October 9, 2013. An encore showing is scheduled for October 16, 2013.
closed Giveaway: For your chance to win one of 5 pairs of tickets to SURGE at POTTSGROVE 12, 110 UPLAND SQUARE DRIVE, POTTSGROVE, Pennsylvania, 19464 on October 16, 2013, ,enter the raffelcopter widget. Winners will be mailed the tickets.